I’m especially heartened to receive emails and convos (through my Etsy shop) in the past few weeks. 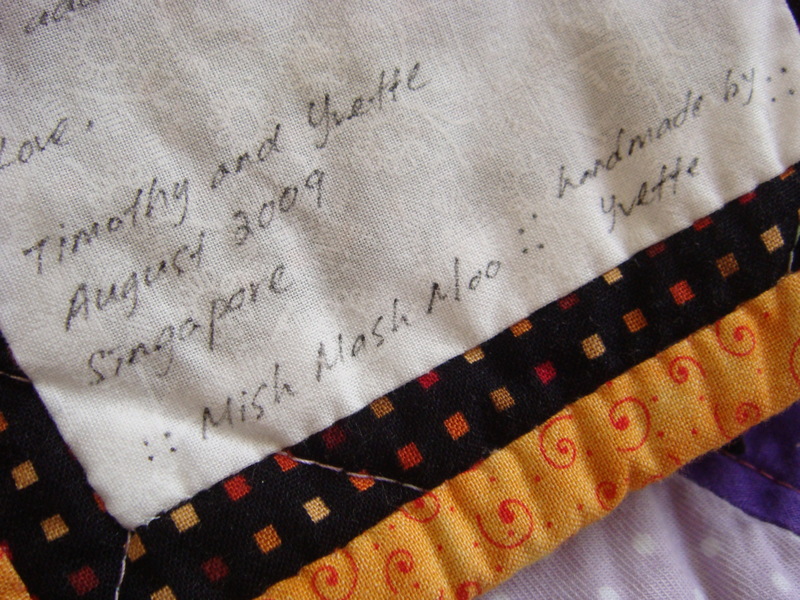 Some wanted to know where they can get quilting fabrics, supplies, workshops, etc in Singapore. Some people wrote asking for custom crayon wallets and also custom sewing for Teacher’s Day and Children’s Day celebrations. I’ve also received some requests for custom quilt jobs. Now, making a quilt, a crib sized or full sized one, requires a lot of commitment, resources and attention. The 1st request for a few baby quilts was turned down because I knew I could not commit to that kind of quantity and timeline. But a week back, I received a convo from a nice lady who wanted a special quilt for a special guy friend. I initially said no, but she said that she would be happy with a lap sized, and simple pattern… how could I say NO to such an earnest request? So, I said yes and offered a price which she accepted. And I started hunting for patterns suitable for a guy, pulling out fabrics that are not too ‘girlish’, and in the process I really had fun. ALL because I was thinking how this would be a gift from such a sweet girl to a special friend. Well, since then I have not heard from the lady and it is a little disappointing to say the least. But this has sort of strengthened my resolve that quilting is reserved for special people in MY life. Until I have the bandwidth, skill and stash, then I can consider making quilt for cash.